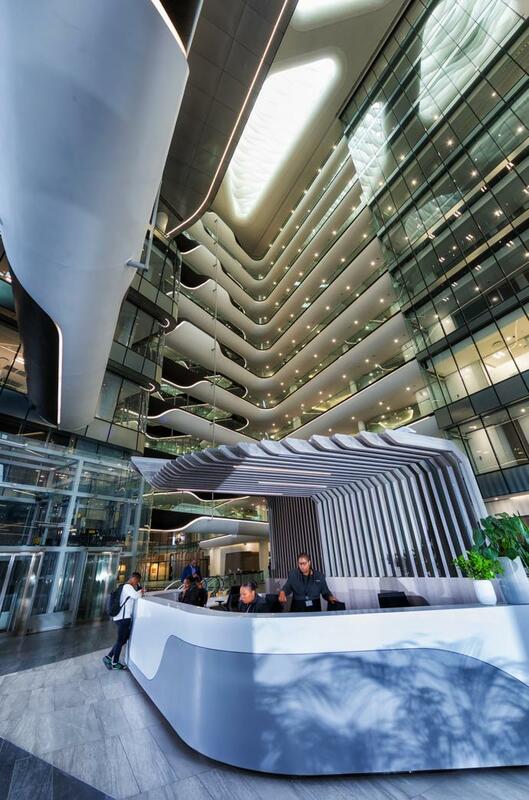 When a petrochemical giant elected to consolidate its operations in new premises in the heart of Sandton, Paragon Group brought the company’s corporate dream to life. 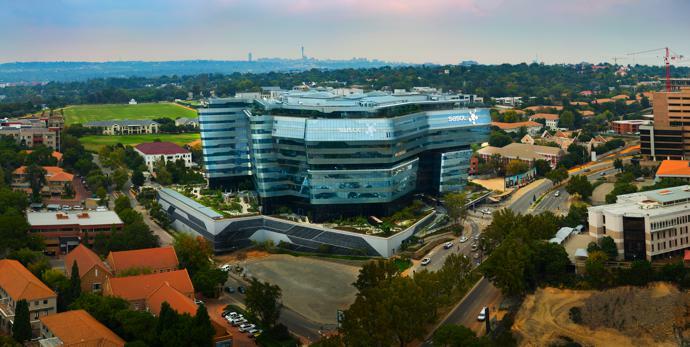 The unification of Sasol’s corporate culture was the primary driver behind the company’s decision to move its business units and activities from a scattering of locations across Johannesburg into a single purpose-built building. 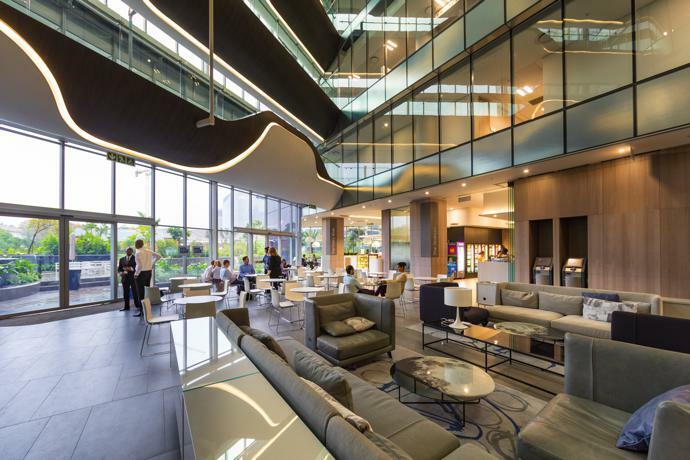 Paragon Architects, led by principal architect Anthony Orelowitz and assisted by project architects, Tershia Habbitts and Jose Ferreira, studied the Sasol logo closely to interpret it as a built form, and used the company structure as the departure point for the conceptual design of the building. 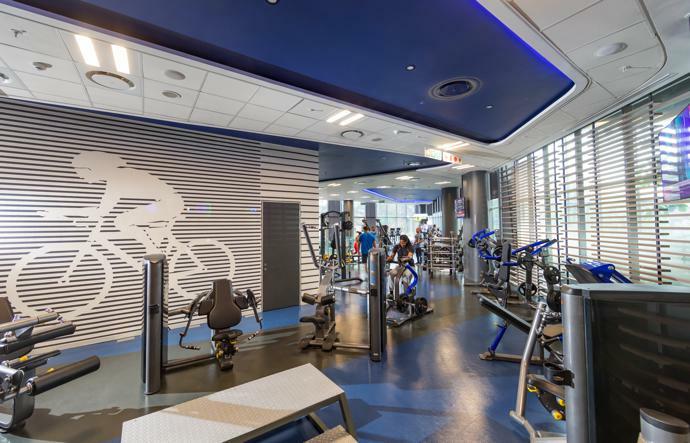 The interior design showcases Sasol’s corporate brand in an elegant manner that considered the architectural elements of the building and brought all Sasol’s business’s together into a single, connected workspace. 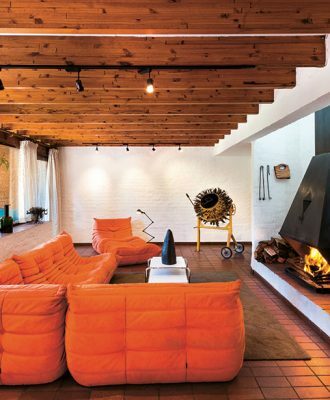 “The concept was initially set up as a straight line linking the various units,” says Anthony. 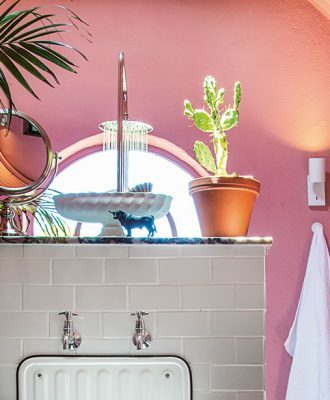 “This was, however, seen as spatially too linear, so the form evolved into something more serpentine, which generated a more interconnected space and was more easily accommodated on the site. Paragon Interface won the tender for the Interior Design, Space Planning and Service co-ordination commission, led by Claire D’Adorante, Dale Friedman and Kirsty Schoombie. 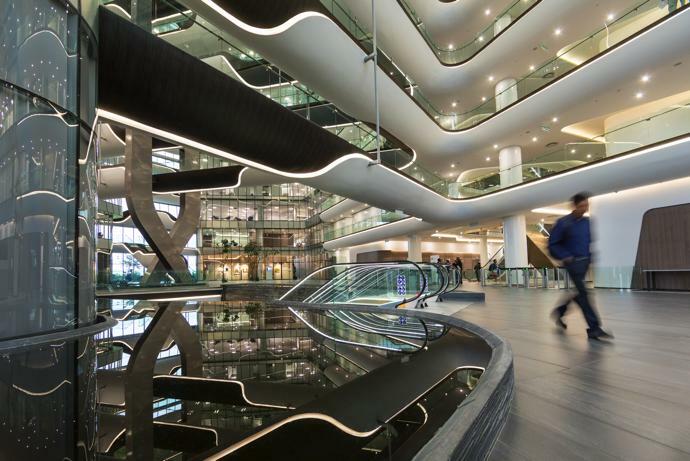 The interior architecture is based around large airy light-filled atria, and open plan office spaces providing staff with a working environment that is both stimulating and calming on the senses. 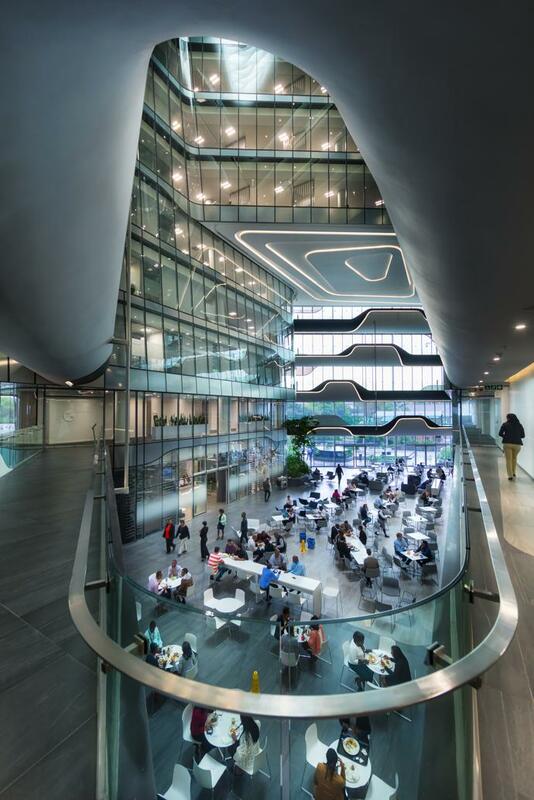 Inspired by the notion of Sasol’s various business units surrounding a nucleus and consisting of a central core and integrated floor plate with bridges that lead to the various departments, the contemporary workplace design allows for free movement both vertically and horizontally through the building. Interestingly, the iconic S-shaped floating glass structure is also the first development that will lead the way in opening up the next new precinct on Katherine Street. The glass facades were carefully engineered to ensure this 5 Star Green Star design satisfied performance and aesthetic requirements. With the Joburg skyline in the background, the building rises from the ground like an azure jewel, reflecting the light. “The glazing is a combination of reflective glass spandrels and vision glass, which combine to form a unified crystal facade,” says Anthony. “It was important to us to push boundaries in this design, which is characterised by light volumes externally and two dramatic skylights articulated with acoustic baffles internally. A central core of circulation and services ties the building together, and the various areas are linked by a series of bridges. 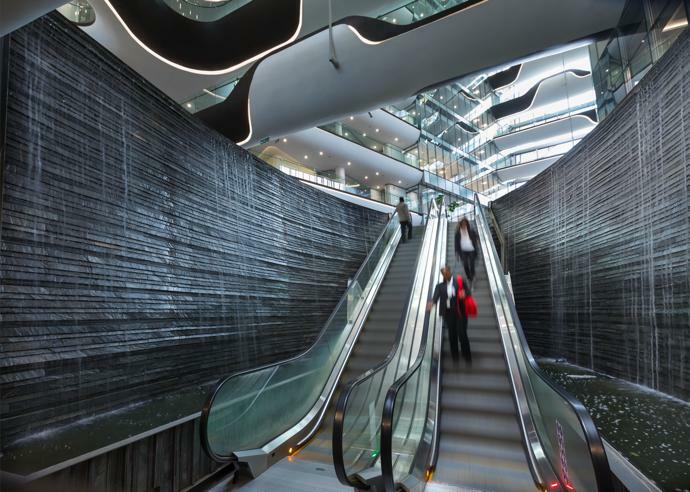 One of the main challenges was the site, which is on a curving edge of Katherine Street: The architects had to ensure a 68 000 m2 building with a capacity of 7 500 people could be accommodated and well connected both vertically and horizontally. The final product leaps the boundary of the commercial edge of Sandton to sit as a floating glass box hovering above indigenous parkland. Winding paths guide visitors past art and sculptural elements, through vegetation displays that showcase carefully chosen indigenous trees and shrubs known for attracting birds and butterflies. Planter walls rise and fall organically, containing rolling and sweeping berms and a forest of indigenous trees, creating sculptural spaces that open up to the sky and that will, with the aid of integrated lighting designs, come to life at night. 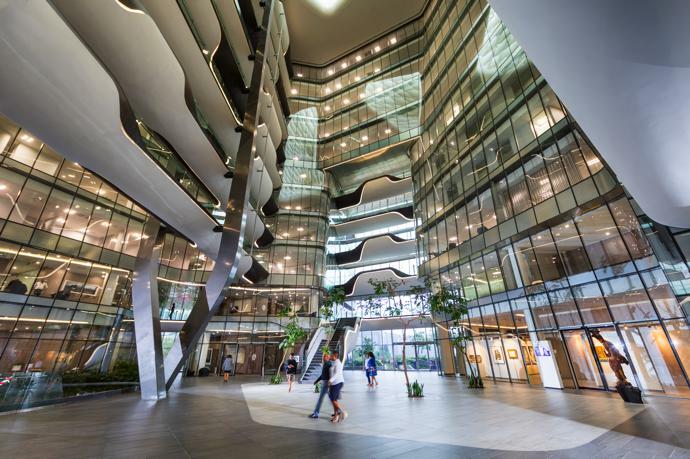 Sasol Place received a Corobrik SAIA Architectural award for Excellence at the Corobrik South African Institute of Architects (SAIA) awards evening in May. 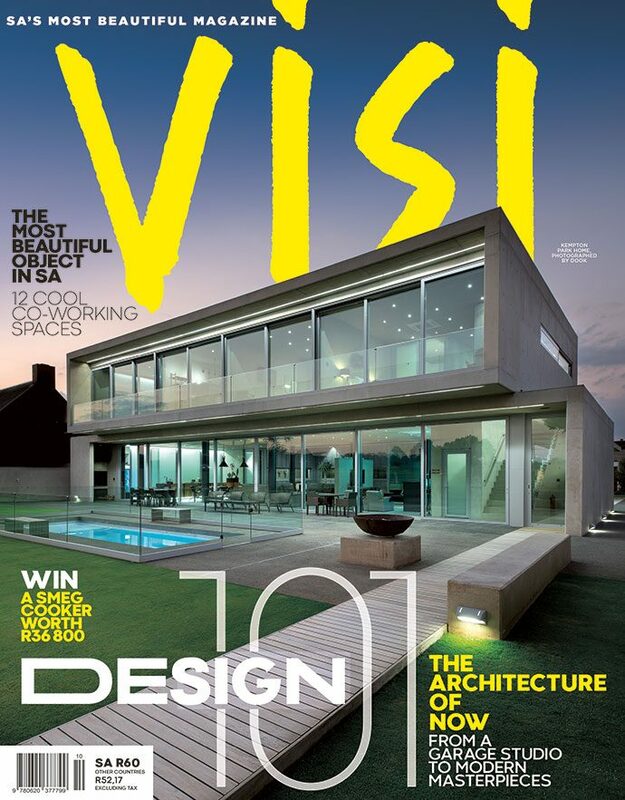 For more information, visit paragon.co.za.